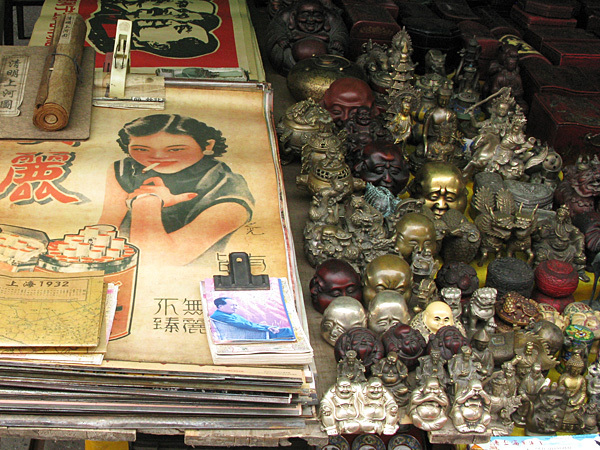 One of my favorite things about living in Asia is the markets. I take that back. One of my favorite things about living anywhere, is the markets. 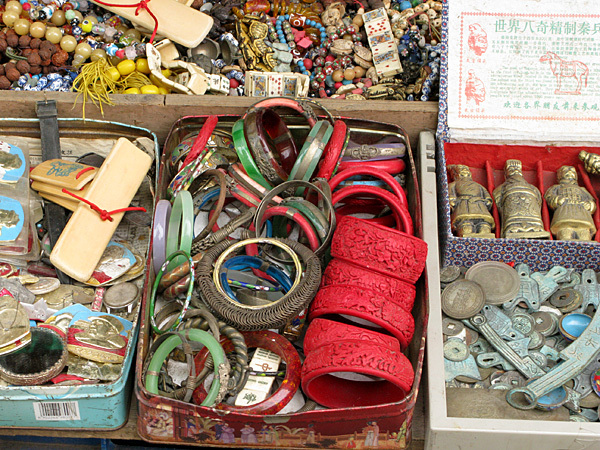 In Nashville, I would go to the monthly Tennessee State Fairgrounds Flea Market with my mom. In Portland, I would go to the farmer’s market every Saturday and the Stars Antique Mall (basically an indoor market) on a regular basis. 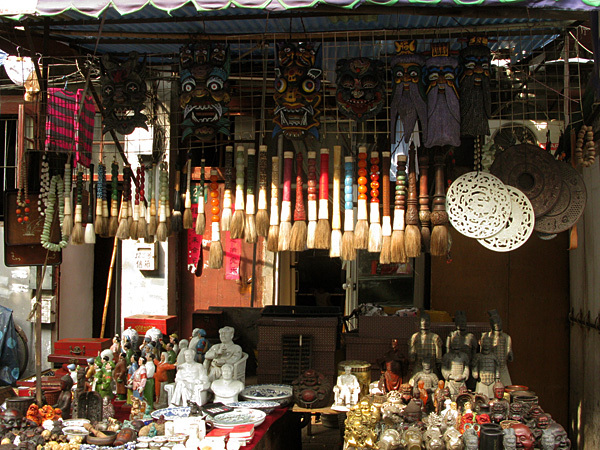 In Bangkok there is the Chatuchak Market. In Chiang Mai there is Talat Warawat and the Sunday Walking Street. 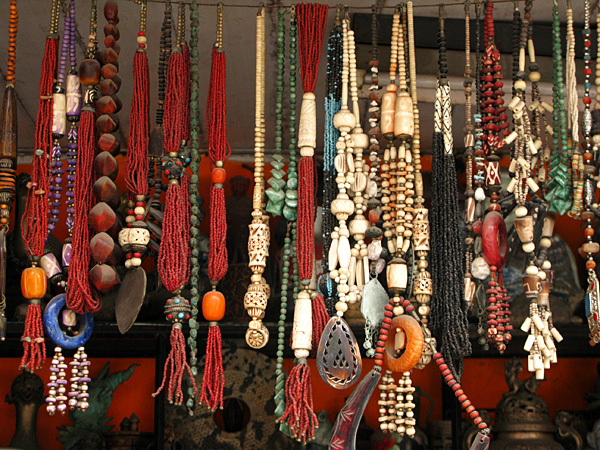 In India, every street was a market. 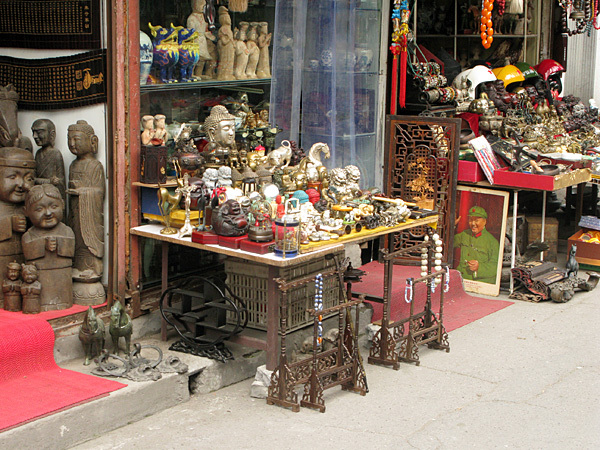 In Shanghai, my favorites so far are the Paper Market, Shanghaitan Mall, the street markets around Yu Yuan Gardens and the Dongtai Lu Antique Street Market. 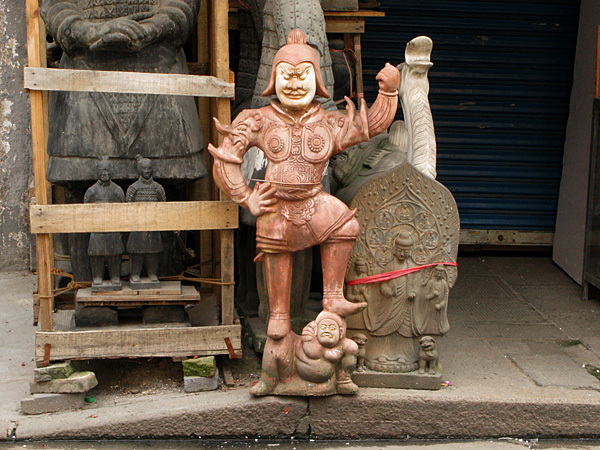 I want to specifically talk about the Dongtai Lu Antique Street Market because it is FANTASTIC. 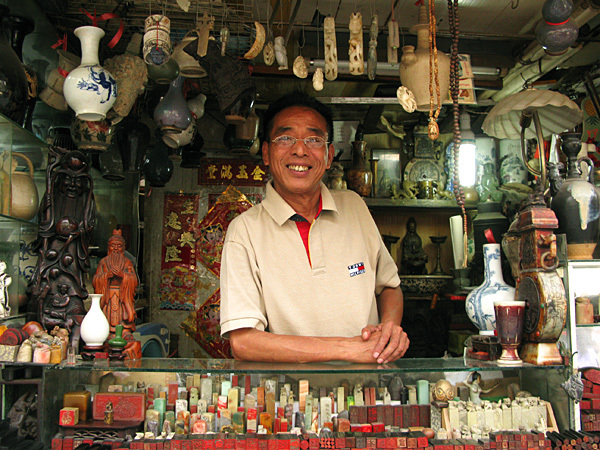 Granted, most of the wares are not antiques. 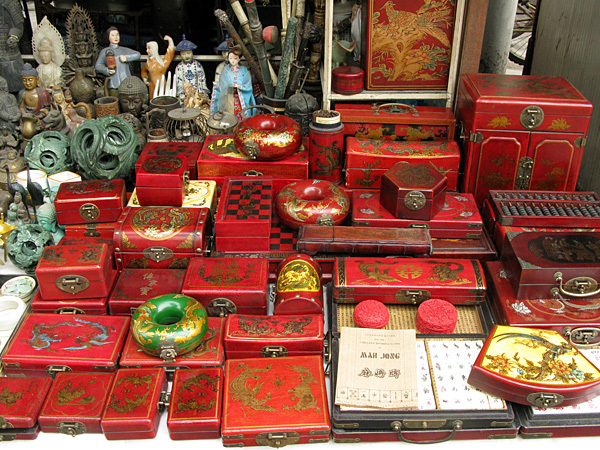 I know this because very few places in China that promote themselves to tourists actually have 100% genuine antique or name brand goods. It’s just the way it is. 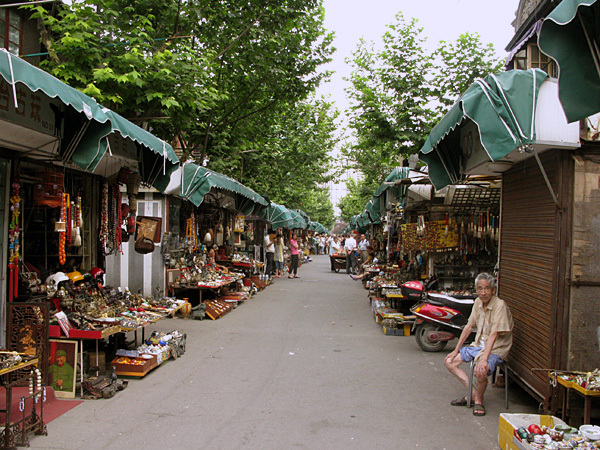 I also want to point out that I did not find this market because I looked at a tourist map. Wednesday afternoon I was riding my bike back from the Yu Yuan Gardens markets and turned down a street to avoid some construction, and there it was. 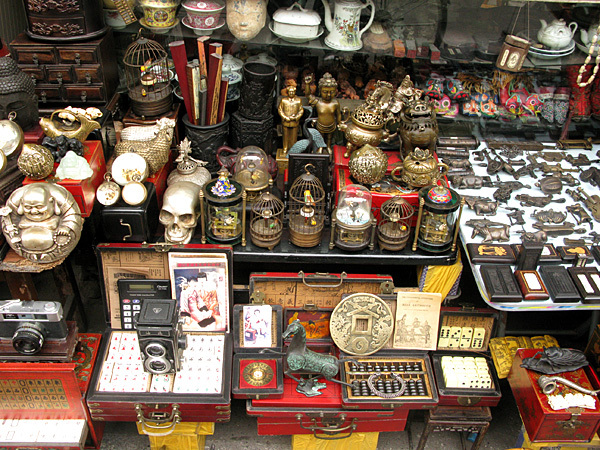 Stall after stall selling small old-looking items….dishes, watches, clocks, caligraphy brushes, Mao propaganda posters, jewelry, miniature terra cotta warriors, books, small furniture….and the list goes on. Obviously, I got off my bike and walked the streets slowly. If Nik had been with me, it would have driven him crazy. But he wasn’t, so I moseyed at my own pace. 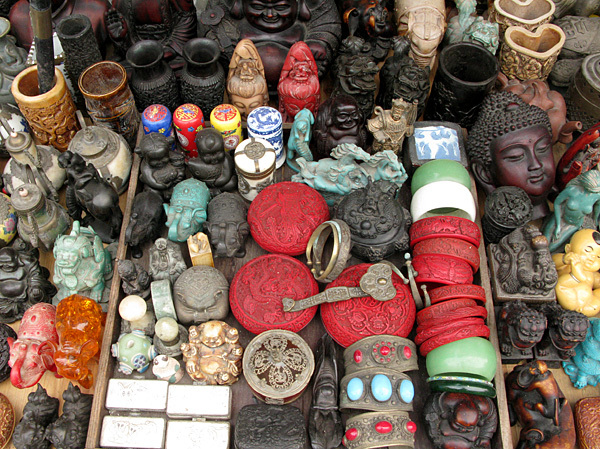 Besides the fact that I love looking at little collections of weird and beautiful things, the vendors at this market were incredibly nice. Many of them let me look at my leisure without bothering me. They even let me take photos without any argument. When I did show interest in something by touching it, they approached and simply watched and waited for me to talk to them. It was a pleasant change of pace where I felt like I was actually in charge of the exchange. I’m sure it is a manipulation technique that they have mastered over the years, but I appreciated the politeness. They also all smiled at me as I passed rather than ignore me or look at me with dollar signs glazing over their eyes. They weren’t vultures, they were simply people selling a collection of things that they liked and they hoped I liked too. I did end up buying one thing, a metal door knocker thing with a dragon’s head biting into a sword. I thought it was neat, and the lady said it was 120rmb ($17). I honestly had no intention of buying it and I was walking away telling her that I would come back, and then she said 40rmb ($5.80). I pondered, and she knew she had me. I didn’t even have to bargain and the price dropped by 60%, so I bought it. It is my little momento of the first day I went to Dongtai Lu. I’ve paid more than that for a bag of popcorn at the movie theater, and this sword eating dragon will stay with me forever!! Yep, I’m a sucker sometimes. I love markets, too! Especially markets in Asia. The markets here in Australia are either filled with rubbish from garage clean-outs or gorgeous goods with boutique prices. 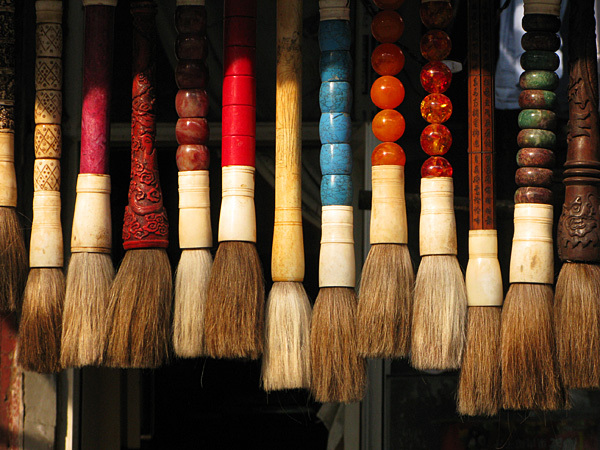 Love these pictures, too, especially the calligraphy brushes. i too am crazy about markets! such a slice of local life (and highly photogenic and colorful too). love your shots! p.s. 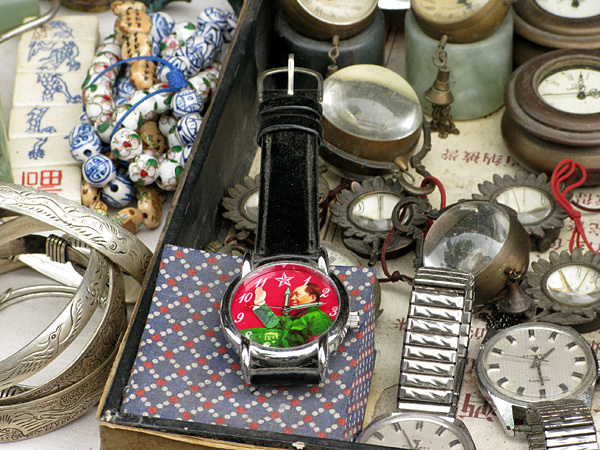 when i went to china when i was on semester at sea, the waving mao watches were all the rage!